SKF Speedi-Sleeve This thin-walled sleeve [0,28 mm (0.011 in. )], developed by SKF, is simply pushed in position over the worn area, providing a counterface surface that is optimized for radial shaft seals. There is no shaft disassembly or machining involved and costly downtime is minimized. Since the same sized seal as the original can be used, there is no need to search for other seals, or keep a stock of different sizes. No special equipment is required since the installation tool is supplied with the sleeve. A mallet and a pair of pliers are all that is needed for the installation. The new generation SKF Speedi-Sleeve uses a proprietary stainless steel material and manufacturing process, resulting in an optimized seal counterface surface that minimizes wear on both sleeve and sealing lip. The proprietary material provides increased strength and excellent ductility properties of the sleeve. Imperceptible lubricant pockets enable the lubricant to reside on the sleeve and thereby prevent dry running of the sealing lip that otherwise can create excessive wear. The contact surface is wear resistant and machined to minimize directionality (0° ±0,05) with a finish of Ra 0,25 to 0,5 µm (10 to 20 µin.). This is, in fact, a better counterface surface than can often be achieved on a shaft. 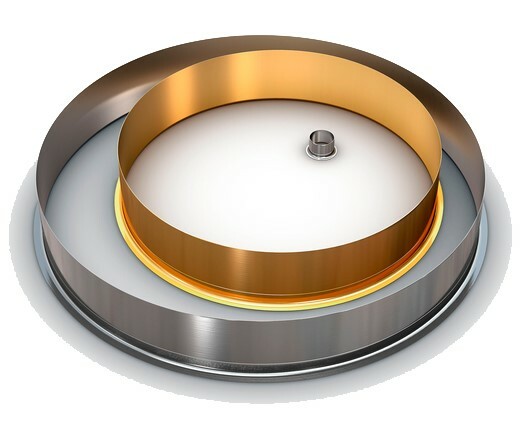 SKF Speedi-Sleeve has a removable flange to simplify installation (fig 1). The flange can most often be left intact, but in applications where the flange will interfere with other system components, it should be removed so as not to cause friction heat and wear debris. The flange should also be removed in applications where it may reduce the supply of lubricant to the seal. This would reduce the cooling effect of the lubricant, resulting in elevated underlip temperatures and premature aging of the seal material. If the flange is to be removed, it should be cut from the outside diameter into the radius in one location prior to installation. The flange can then be twisted and raised up after installation and grasped with a pair of long-nosed pliers and twisted into a coil. The standard size range covers sleeves for shaft diameters from 11,99 to 203,33 mm (0.472 to 8 in.). Depending on production quantities, non-standard sizes can be manufactured. Each sleeve is designed to fit a specific shaft diameter range, usually above and below the nominal shaft diameter. This permits some flexibility to accommodate variations in the actual shaft diameter.